It’s your move,Wordfreak! By Falguni Kothari is like a true blue masala flick having all the ingredients in it – romance, action, intimate moments, suspense etc. This book gives you a glimpse into the lives of urban Indians residing in metro cities. It deals with BFFs, live in relationships, online friendships, dating and gamut of other things which can easily be noticed or heard of in these cities. What do you get when you mix words, wit and the World Wide Web? – A Scrabbulous Romance. 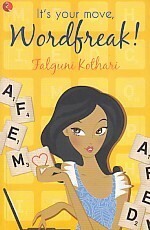 Can the real Wordfreak and Worddiva spell love in capital letters or is the game of life a deal breaker for them? Born and brought up in Mumbai, Falguni Kothari currently leaves in New York with her family and one utterly spoilt dog. When she is not playing Domestic Goddess, Soccer Mom or Canine companion she is found embroiled in scandals – usually on her laptop. This is her first novel. For a first timer, this book is very well written. The storyline is remarkable as it seems to be relevant in today’s time where each one of us is independent and wants our own space. Gossiping with friends, romancing your partner, dealing with professional turmoil or sharing some quality time with your family – all these aspects of our everyday life have been beautifully articulated in this book. We humans have a tendency to complex things while they actually are pretty simple. This book is a perfect example of a couple who complexes things around them so much that it gets difficult to simplify. A splendid attempt by first time author Falguni Kothari in narrating a tale of two hearts, lost somewhere in the ocean of human emotions. The story is about two people based in Mumbai who meet online with fake identities on a Scrabble site and start seeing each other. The rest of the story is based on how their real life identities change the course of their relationship. The lead characters Aryan and Alisha have been very well defined and seem to be very existent. The pace of the story is extremely quick leaving you no chance of feeling bored even for a moment. The author has handled the romance portion very well and I would give her full marks for it. The intimate scenes are very well crafted giving you goose bumps as you read it. Though the overall language in the book is impeccable there has been some use of some crude words which could have been avoided according to me. It could all be in jest with a possibility that most of the urbanites might be using such language in day to day conversations but reading it in print makes you cringe at least for a moment nevertheless the overall narration covers up this flaw leaving you with no time to do any fault finding. Strength of a woman seems to be the hidden element of this book as each and every female here comes across as a fiercely independent character. I especially liked the way Alisha’s character has been displayed. I am sure most of the urban Indian working women would be able to connect with her strong, resilient with a no-nonsense attitude where she has drawn lines around herself setting limits for people in her life. The beginning of the book is very appealing and reminds you of the Mills and Boons stories where the boy-meets-girl and sparks fly. There is slight tint of suspense added to the story in terms of both these characters past life. I will not play a spoiler here by divulging any further details and leave it for the readers to know themselves. I like the way the author has dealt human relationships. Many times in life we tend to carry excessive baggage of unwanted emotions which ruin things further for us. This tale is about those unwanted emotions and the damage which they can cause in our lives. Over all a superb attempt by Falguni Kothari, a must read to feel the romance spiced with a dash of suspense. P.S – I simply loved the way the hero addresses the heroine as Sunshine. It made me go weak on my knees every time he called her that. It’s too sweet a moment to be missed!! This book is like candy floss. Cute, fluffy, sweet, melts in the mouth and leaves you with a smile on your face once you complete it. Great review girl...I love the foodie's view point that you add in each review... I got Devotion of Suspect X...read it? The foodie in me cannot help coming out each time. M glad you like it!! Read your review, interesting and tempting must say. Will try to read it soon. I will also try to read it..thank u..